General Description: The Jack's Reef Corner Notched point is a broad, thin corner notched point of medium size that frequently has angular blade edges. The shape is often ovoid or pentagonal in outline and flat or nearly so in cross section. Within this range of variation, the blades of some specimens exhibit an obtuse angle along each edge. This obtuse angle can be distinct and sharp with straight edges converging from the tip and the shoulder or it can be an indistinct joining of two excurvate edges between the tip and the shoulder. The blade edges vary from relatively straight to excurvate. The stem is corner notched and basally flaring. The barbs are small to large, thin and sharp. The base is straight and occasionally slightly smoothed . The proportions of the typical Jack's Reef Corner Notched point are one and one-fourth times as long as wide. The length ranges from about 25 mm to 58 mm with the average being about 44 mm to 51 mm. The maximum thickness is 4.7 mm to 6.34 mm. Materials used in manufacture are eastern Pennsylvania jasper, New York Onondaga flint, and Flint Ridge, Ohio Chalcedony. The points appear to have been extremely well made by carefully controlled percussion flaking followed by precise pressure flaking techniques. The barbs are always thin and delicate and prone to breakage. Pressure retouch was used to sharpen and align the blade edges. The Jack's Reef Corner Notched point type is a late to Middle Woodland point. It appears to be one of the forms found in the Intrusive Mound culture graves at the Mound City Hopewell group in Ross County, Ohio. 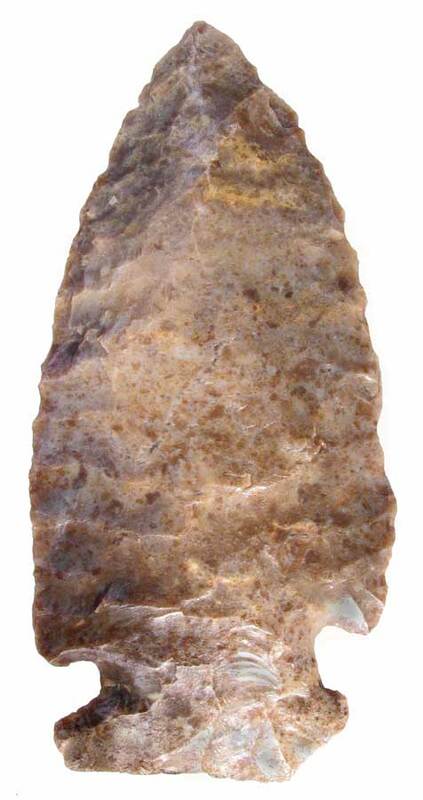 Justice postulates that the Jack's Reef Corner Notched point probably represents one of the first true arrowheads used in the Eastern United States. They were superseded by the Levanna triangular type. The Jack's Reef Corner Notched has a very wide range and is found in New England, New York, New Jersey, Delaware, Pennsylvania, Ohio, Indiana, Michigan, Wisconsin, Ontario - Canada, West Virginia, Kentucky and northern Virginia, northern Alabama, South Carolina and Tennessee. The Jack's Reef Corner Notched point was named by William A. Ritchie in 1961 from specimens he found at the late Point Peninsula Jack's Reef site in Onondaga County, NY in 1947.